An İstanbul court on Wednesday rejected an objection filed by lawyers to the imprisonment of 10 Cumhuriyet daily editors, executives, as well as Turkish journalist Ahmet Şık, who have been behind bars for the last 6 days. According to the state-run Anadolu news agency, the 12th Penal Court of Peace denied the request of the Cumhuriyet daily’s lawyers on the grounds that evidence has not yet been collected. The İstanbul Chief Public Prosecutor’s Office on Oct. 31 issued detention warrants for 18 journalists from the Cumhuriyet daily on charges of aiding the terrorist Kurdistan Workers’ Party (PKK) and Gulen Movement, which Erdoğan and the AKP accuse of masterminding a failed coup attempt on July 15. 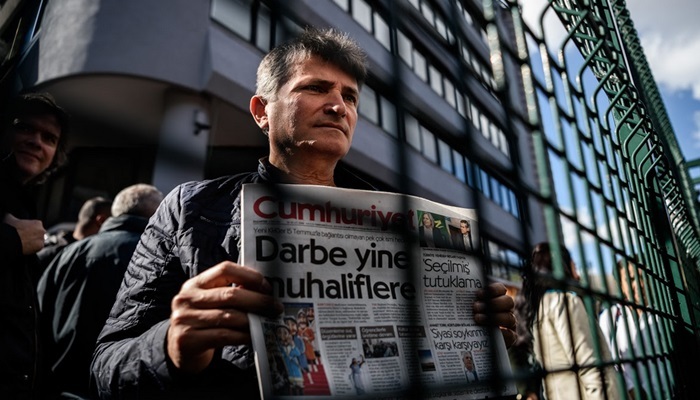 Cumhuriyet editors deny the charges. In a similar vein, journalist Ahmet Şık was arrested by a court last Friday on charges of disseminating terrorist propaganda for the PKK, the Revolutionary People’s Liberation Party/Front (DHKP/C) and the Gulen movement. According to the Anadolu news agency, Şık was arrested for his interview with a PKK leader, Cemil Bayık, and his columns questioning controversial National Intelligence Organization (MİT) trucks that were allegedly carrying weapons to illegal groups in Syria.